The facility and cemetery is located about 2 1/2 Miles South of Mifflin, Union Township, Crawford County, Indiana. 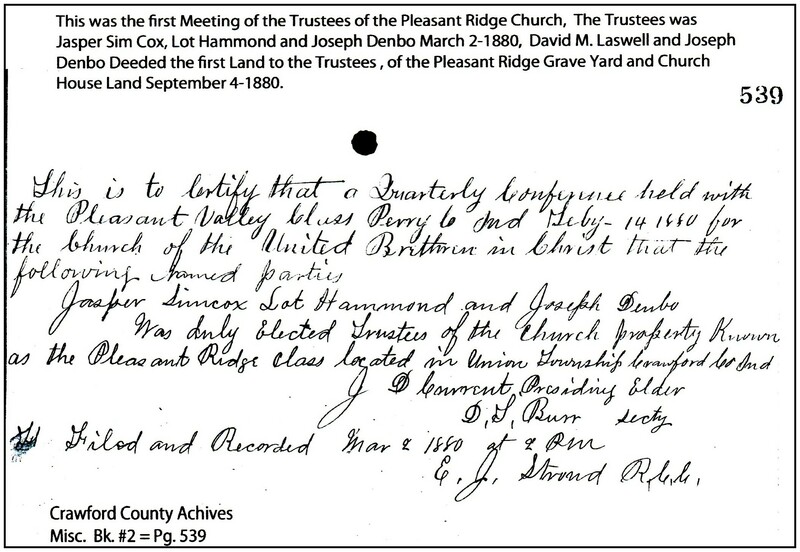 1880; March 2; Jasper Simcox, Lot Hammond and Joseph Denbo was Duly Elected Trustees of the Church Property Known as Pleasant Ridge Class Located in Union Township. Crawford County, Indiana. Filed and Recorded March 2, 1880 at 2 pm. 1880; September 4; Joseph Denbo Deeded 1/4 Acre in section 6 Township 3 south Range 1 west to The Pleasant Ridge Trustees for the Grave Yard. 1880; September 4; David M. Laswell Deeded 1/4 Acre in Section 7 Township 3 South Range 1 West to the Pleasant Ridge Trustees For The Church House. The First Church Was Built of hewed Poplar Logs was used until 1906. The Second Church House was built in 1906; some of the Logs were sawed and were used in the sawed lumber of the new church. 1913; December 23; David U. Newton Deeded to Trustees of the United B.C. Pleasant Ridge Grave Yard Section 6 Township 3 South range 1 west about 1/4 acre. 1953; November 28; John and Dora Felker Deeded to the Trustees Pleasant Ridge E, U. B. Church Yard Section 7 Township 3 South Range 1 West about 1/4 acre. 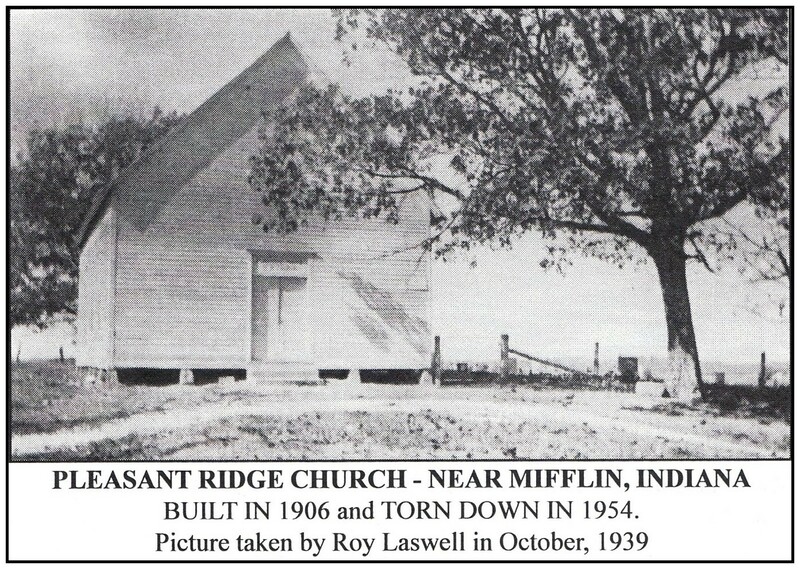 1954; The Third Church was built, a Basement was dug and the church was built of concrete block, some of the old rafters out of the old churches were used in the block church. 1976; September 27; Russell Newton, Vernie Newton and Hebert Newton Made a offer to purchase the Real Estate Known as the Pleasant Ridge United Methodist Church for $1,000 to be used for weddings and Funeral, homecomings and other social events and/or meetings with the cemetery or other civic purpose. You can find Tick Ridge Cemetery on find a grave at this link: Tick Ridge Cemetery on Find A Grave.